Art Supplies As Art, and One Cool Artist. I promise this will be my last art supply/decor post for a while, but I can’t help myself on this one. Felissimo makes a stunning display case — Aurora — that affixes to the wall and is meant to contain colored pencils. 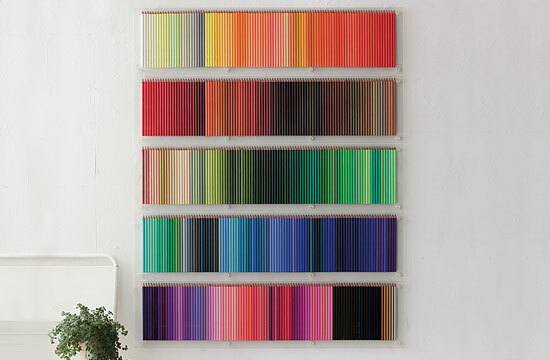 One case holds 100 pencils; five cases will get you a display like the one pictured below. Each unit is 3,900 yen, which is about $50 US dollars. AHHHHH, I love EVERYTHING about it. Need pencils? They also have a pencils-of-the-month plan that delivers 25 gem-toned pencils to you every month for 20 months. Now for me, THAT is better than any flower-, wine-, or fruit-of-the-month club. It’s about 1,800 yen, or $20 US dollars, per month…or $400 and some change for all 500 pencils. I’m curious to know just how many people have invested this much money in colored pencils. If I had an easy $650 to drop on this set — and didn’t have a mini-monster who most certainly would scale the furniture in order to access as many writing instruments as possible then proceed to draw all over my stuff and use them to stir his barbecue sauce — I’d probably get the entire set. For now, I’ll settle for some Prismacolors and a vertically striped painting. Speaking of which, these remind me so much of a German artist I fell in love with about six years ago, Markus Linnenbrink. I can’t remember if my husband introduced this artist’s work to me or if I introduced it to my husband, but he was one of the first artists that I really adored and appreciated. He works with such rich mediums — epoxies, encaustics, resins and acrylics — and you can almost feel the textures with your eyes. So I do suppose it’s fitting that the actual art supplies themselves, in the form of the Felissimo pencils, evoke Linnenbrink’s work for me. Both are so beautiful and so inspiring and they are each completely representative of why I love what I do. That’s something I’m increasingly thankful for.